The Library Art Gallery enters its 5th year under the coordination of Atilla Güllü. 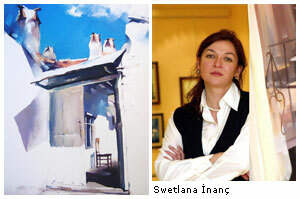 The new season kicks off with an exhibition entitled "Ural Rüzgarlarının Ege Sahillerinden Getirdiği" by Svetlana İnanç. Ms. İnanç has participated in various mixed exhibitions in Russia and Turkey. You can see her paintings between October 10 and November 1 at the Main Campus Library from 10:30 a.m. to 6 p.m. on weekdays.